In the autumn of 2014 I picked up an injury when I got a Grade 3 ankle sprain. I couldn’t swim much due to lingering chest infection (and didn’t want to either, as open water swimming season was ending). However years of ingrained habit made me swim anyway. I thought some kicking might help rehabilitate my ankle but I found a kilometre to 1500 metres of kicking (as a distance swimmer, I don’t do much kicking anyway and what I do is rubbish) tough on my neck. (Another reminder of my age). This made me finally decide to try a swimmer’s snorkel/snorkle, something I’d been considering for a while. 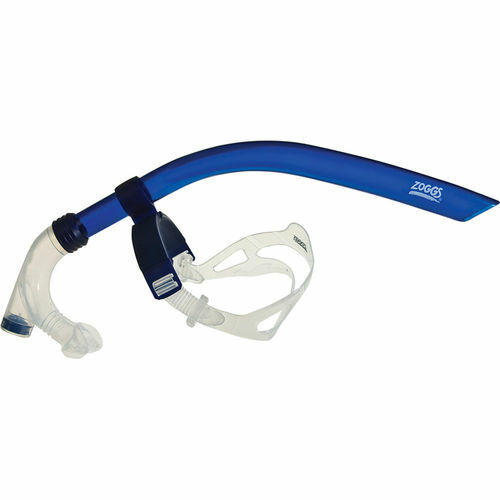 A swimming snorkel differs from a regular diving snorkel in that the breathing tube is placed front and centre, running directly up from the mouth between the swimmer’s eyes. It is held in place by a plastic brace that rests on the swimmer’s forehead. Because the snorkel sits between the eyes and sits so close to the face, vision isn’t really affected (contrary to claims by some new snorkel types such as PowerBreather). Looking at various prices online, I consider most overpriced. But just after another of my noseclips split (Hey Big Nose! ), I saw a Zoggs Centre Line snorkel in Kilkenny’s Watershed pool which included a “free” nose clip. The price was €23 and since nose-clips cost €4.99 here, the price was reasonable. I hate overpriced swimming products, something that is increasingly happening, likely because of the growth in the adult triathlete market, who will apparently buy anything for any arbitrary price, regardless of utility or appropriateness. I’m looking at you, triathletes! It took me a couple of days to adjust to using the snorkel. Initially I used it on the long kick sets, and it did relieve pressure from my neck. Used with my Zoomer Z2 fins it made my kicks sets far more tolerable and just as important more effective. I kicked harder, better and for longer. A dive mask or special goggles are not required for using a swimming snorkel, I simply use my regular Swedes. The first day I didn’t attempt flip-turning and my attempt the next day wasn’t great. The snorkel will of course always fill with water once under the surface and when pushing off the wall it will also be pulled sideways, sometimes causing goggles to leak if the strap pulls on the goggle strap. Some practice however solved these problems. A deep breath is required before turning and a strong exhalation once you’ve surfaced is sufficient to clear the snorkel. You need to concentrate a bit more to remember to break more deeply, and to not trickle exhale on the turn as you would do more normally. There are a couple of other adjustments required. You need to concentrate on taking a deep inhalation before flip turning to have sufficient air to clear the water from the tube. I’ve read that should try to emulate your normal breathing pattern (e.g. bilateral on three strokes), but while you have longer time to breathe, the air flow capacity of the snorkel is less than your normal inhalation so I disregard this idea. There are also cap options for other makes of centre-snorkels to reduce the incoming air to force swimmers to work harder and therefore improve their respiratory system. Children should never be allowed to use a snorkel while unattended, since the tube is a two-way system and carbon dioxide is heavier than air, and so could conceivably accumulate up in the tube and affect respiration or cause a child to pass out. Keeping the snorkel from being pulled sideways during a flip-turn simply requires correct streamlining off the wall and holding the end of the snorkel stable between the arms. Like all good snorkels, there is a purge valve at the bottom of the tube below the mouth. If some water from splash gathers here a strong exhalation will clear the tube. However simply using a snorkel for relieving neck stress during kicking is insufficient reason for most people to use a snorkel. The more important use of a snorkel however is as a technique improvement tool. Using a snorkel will allow even an experienced swimmer to concentrate fully on certain aspects of technique. Taking away the requirement to breathe allows you to keep your body stable. Allows focus on lateral rotation. Allows focus on extension, catch and pull. One of the most useful benefits is to feel stroke imbalances usually present between sides when breathing. I have started to use the snorkel during warm-up prior to long sets, as it helps me settle into my stroke more quickly. I continue to use it for kick sessions, and while I will never have a powerful kick, since introducing the snorkel, I have been doing more kick sets. The Zoggs snorkel is nothing special. Finis, who origianally introduced the centre snorkel and others offer over-priced snorkels with various caps on the tube to reduce incoming splash, not something with which I had a problem, though if you intended using a snorkel for butterfly training, it may be a consideration. The previously mentioned Powerbreather isn’t yet available, but apparently uses a double-sided tube system and a new air diffusion membrane through which stale air is expelled rather than up through the tube through which you are also inhaling. Overall, I really like the swimming snorkel and recommend it as a useful addition to swimmers of all levels. A diving snorkel isn’t an adequate substitute and should be avoided for swim training. Swim snorkels are now standard training equipment for intermediate and elite level swimmers. ← How To: What is Wind Against Sea?